VENUM COMPRESSION, VENUM RASHGUARDS, VENUM IN IRELAND. 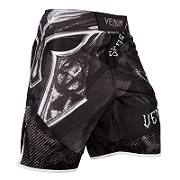 Venum Gladiator 3.0 Rashguard. Venum honors the gladiators, these legendary warriors that have marked the history of the Roman Empire and battle arenas. Like all rashguards of the brand, the Gladiator 3.0 rashduard has Venum Compression technology that improves blood flow to the muscles, for increased performance and reduced recovery time. The Venum Dry Tech technology provides optimum control of body heat. Also, a silicone band at waist level allows full coverage of the upper body and provides protection against the minimal injuries, friction and microbes. The quality of Venum Gladiator 3.0 rashguard is impeccable! Its design is superb and authentic, as often with Venum. * 87% Polyester - 13% Spandex. * Fabric known for its elasticity and strength. * Compression Technology: improves your blood circulation to the muscles. * Speeds up your recovery time. * Impressions sublimated into the fiber for maximum durability. * Fitted cut leaving no outlet to your opponent. Reinforced seams. * Rubber band located at waist for keeping your rashguard the right place. * Perfect coverage of your body during the fight.